The sentencing of Ahok, Jakarta’s Christian Governor, to prison on blasphemy charges, May 2017. A new report into religious freedom in Indonesia finds religious minorities are fearful that their country’s reputation as a “tolerant Muslim-majority nation” is being undermined by radical Islam’s growing influence on politics and society. 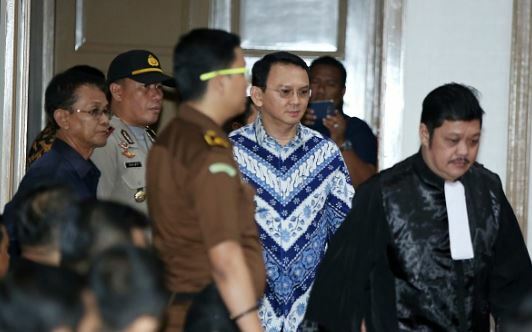 The report by Christian Solidarity Worldwide (CSW) highlights the case of Jakarta’s Christian former governor, Basuki Tjahaja Purnama (known as “Ahok”), who is currently serving a two-year prison sentence after being convicted of blasphemy. The charity’s fact-finding trip to Indonesia coincided with the verdict. CSW’s report found that many religious minorities and civil society activists see Ahok’s high-profile trial and prison sentence as symbolic of rising religious intolerance in Indonesia. “Ahok’s case has become a barometer,” a representative of the minority Ahmadiyya Muslim community said. During the trip, CSW heard about a 15-year-old schoolgirl from “the most tolerant high school in Yogyakarta” (on the island of Java and known as “the city of tolerance”) who was suddenly rejected by her Muslim school friend because “my god does not allow me to be friends with people like you”. This happened shortly after Ahok’s sentencing – evidence, the report said, “that Indonesia now has a serious problem with religious intolerance”. The report concludes: “The level of fear among religious minorities is palpable. ‘Christians face pressure from radical groups and in some cases they have lost the courage to worship. They feel afraid,’ said one pastor in Bandung. The same is true of the Ahmadiyya, the Shi’a and other minorities, and of Sunni Muslim voices defending pluralism. Indonesia’s pluralism is very much in peril”. Reviewing the report, Catholic journal The Tablet said Ahok was “a poster boy for Indonesia’s tradition of pluralism and religious tolerance … defeated in elections in April largely because his political opponents played the religion card.